Come October and the smell of roasted chestnuts wafts all over Italy. 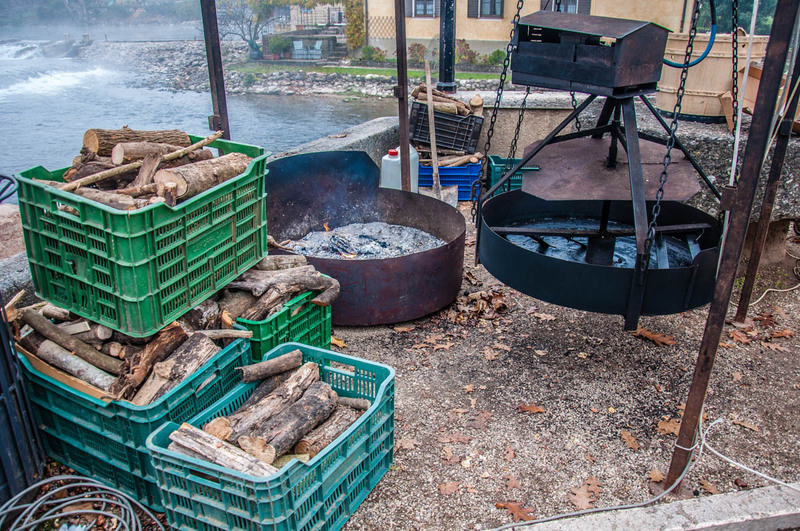 Everywhere – from local festivals and celebrations to art and craft markets and even school fetes – you are bound to come across a chestnut roaster calling you with its unmistakably delicious smell. “How can you resist a paper cone filled with hot roasted chestnuts?”, I ask my husband this simple question every time that we find ourselves at a castagnata – a roasted chestnuts festival in Italy. He looks peat me while I tuck into yet another chestnut – just plucked off the fire, it’s soft texture crumbling under my impatient fingers stripping its blackened shell. “They are so sweet and earthy.”, I say. “Pass me another one!”. “They taste like wet biscuits.”, my husband complains. So, it’s a win-win situation. Even for the chestnuts, as by devouring them to their last crumb, I feel that I fulfil their destiny – that to let us all know that autumn in Italy is undoubtedly upon us. If you love roasted chestnuts and you find yourself in Italy in either October or November, here are a few notes to guide you to the nearest castagnata. 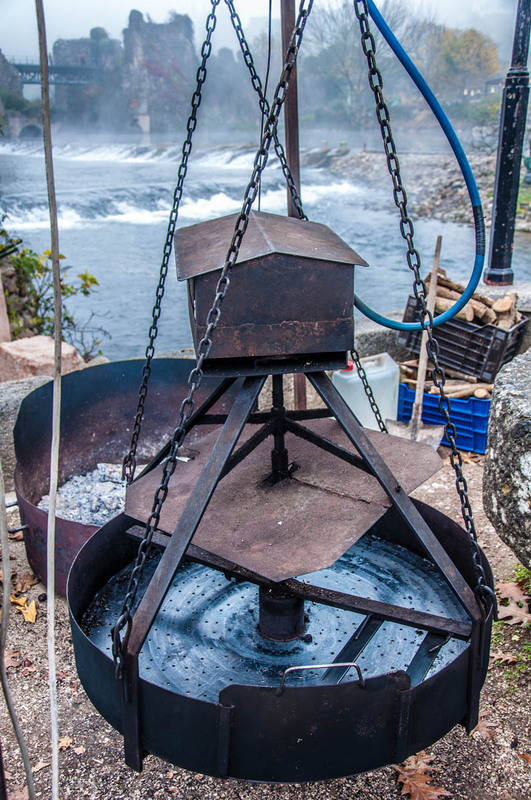 a small or large chestnut roaster set up alongside a food festival, an art and craft market or any other such event. Castagnate are held all over Italy in the months of October and November. 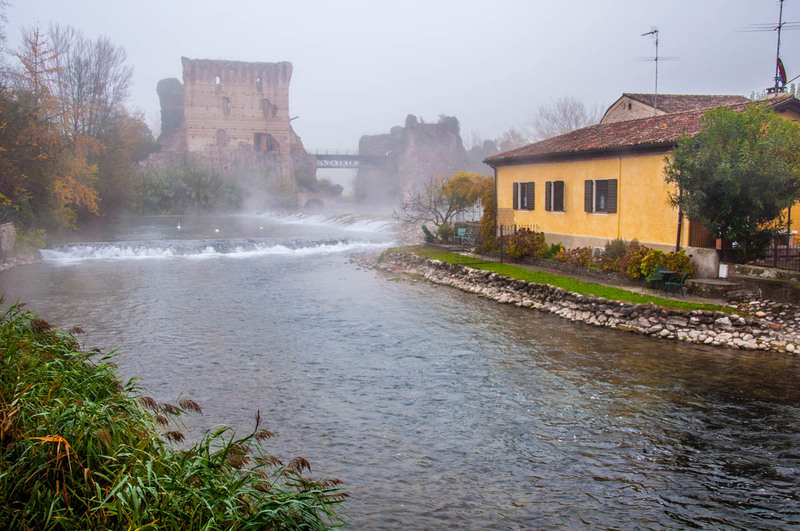 For example, I took the photos used to illustrate this blog post during a castagnata that was organised last November in Borghetto sul Mincio. 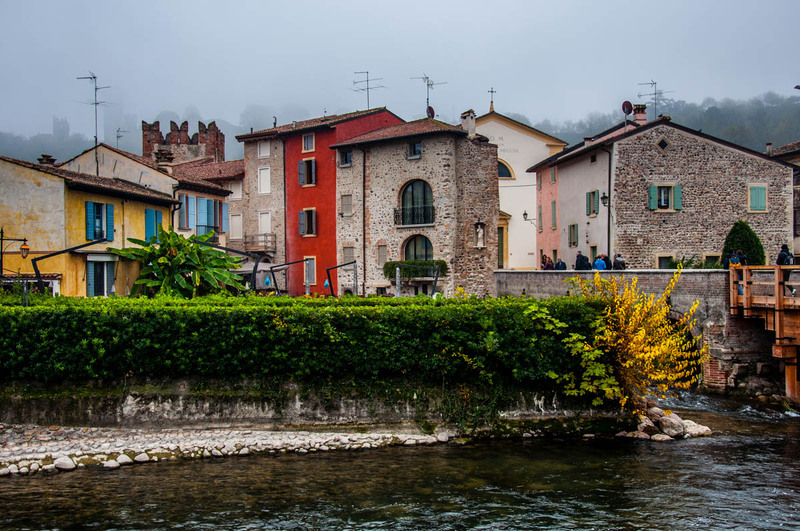 Borghetto is a stunning hamlet on the river Mincio that I love revisiting. 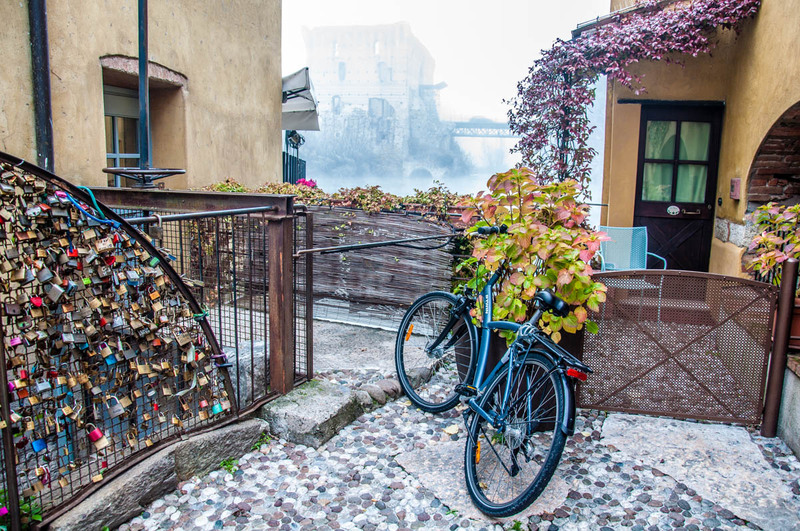 It is very atmospheric with its old water mills that have been turned into restaurants serving the local delicacy – handmade tortellini with different fillings, which are also known as ‘love knots’. 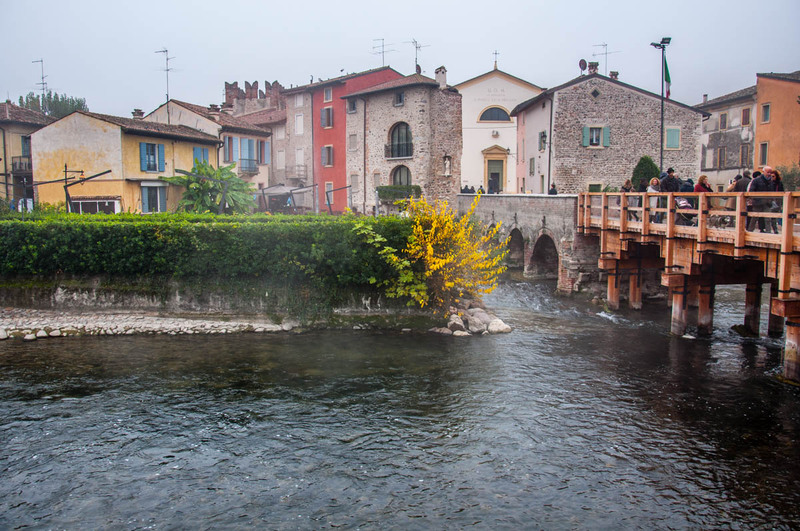 Another curious tidbit is that Borghetto is the spot where Napoleon fought the Austrian Army in 1796 forcing it to retreat up to Trento. 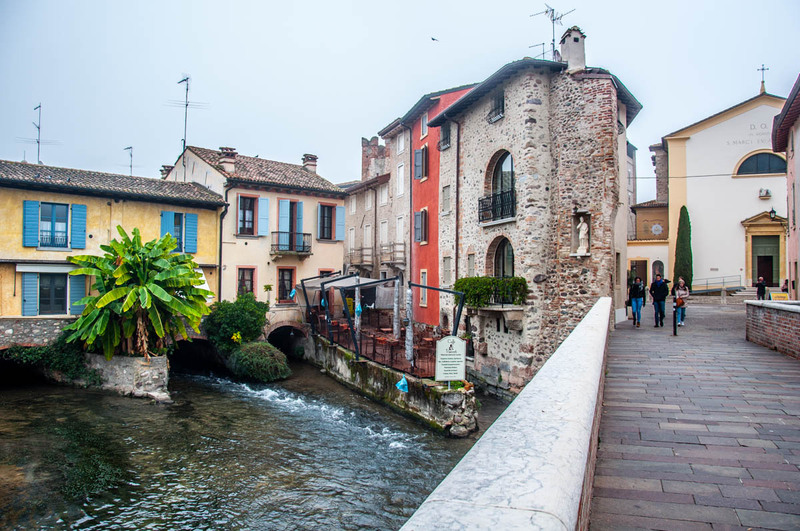 It was the second weekend of November 2017 when we headed to Borghetto for a nice family day out. It was incredibly cold in that bone-chilling, soul-freezing way that only foggy autumn days can inflict on you. 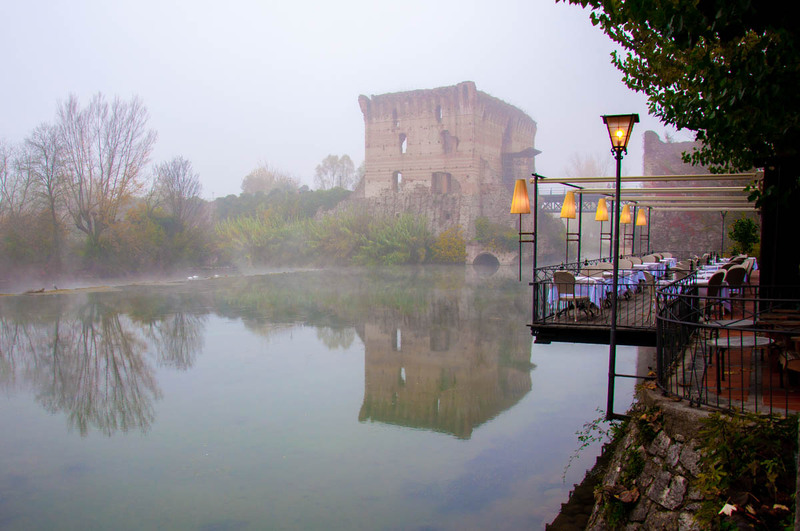 With its mills overlooking the medieval Visconti Bridge, Borghetto was as beautiful as ever, the fog giving it a bit of a ghostly appearance though. 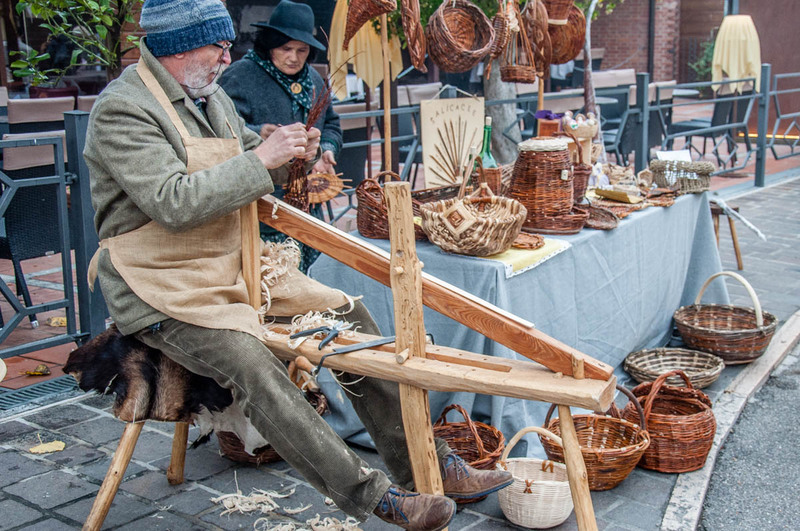 A small art and crafts market was in full force and we happily observed the basketmaker’s demonstration before purchasing a lovely handwoven basket which is one of our most favourite souvenirs of our time so far in Italy. Further away and just after crossing the small bridge that is half-stone, half-timber, we came across the castagnata pictured herewith. It was a significant operation with a traditional wood-burning chestnut roaster which gave the chestnuts a lovely smokey taste. The huge round pan had a perforated bottom allowing the chestnuts to roast over the hot coals. 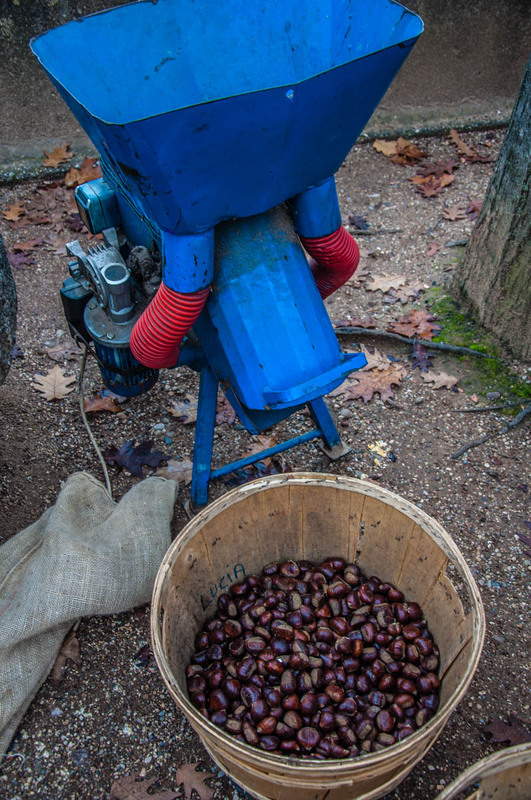 I loved the blue electric machine used to slice the chestnuts open in preparation for their roasting. You know how the roasted chestnuts sellers you can see around Paris and London close to the Christmas holidays use a small knife to slice a cross in the shell of each chestnut before putting it on the grill?! 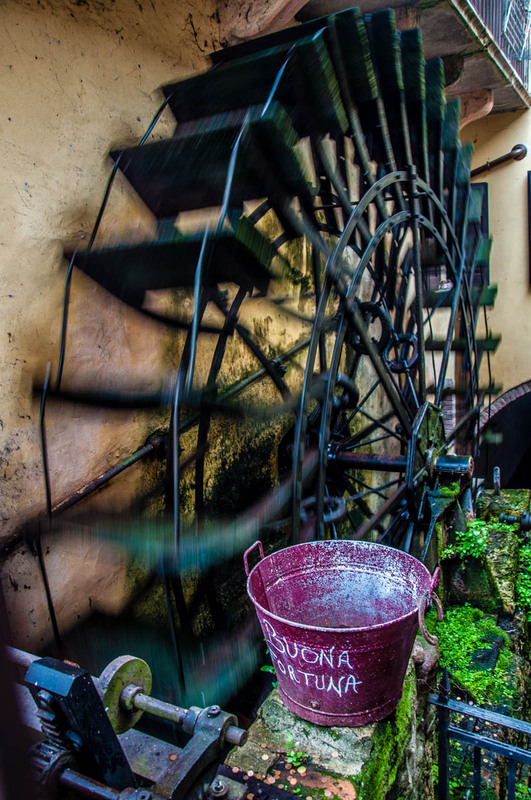 Well, the castagnata in Borghetto was doing such brisk business that a manual handling of each and every chestnut would have created a huge backlog of orders. Instead, the machine quickly and hygienically was slicing the chestnuts as they were fed into it. Once the roasted chestnuts were scooped off the roaster, they were placed in a large wooden barrel padded with a thick blanket. This way, the chestnuts were kept warm for as long as possible. We joined the queue. Soon I was peeling the soft shells off the roasted chestnuts that were served to us in a traditional brown paper cone. A small corner had been set up allowing people to congregate and peel their roasted chestnuts. The thick layer of shells was a testament to the kilograms of roasted chestnuts that had already been consumed there that day. Later that afternoon, we drove up to the nearby town of Peschiera del Garda where a local festival was taking place. A chestnut roaster had been set up there, too. So, yes, come October and November, castagnate are held all over Italy. If you love roasted chestnuts, ask at your accommodation or the local tourist information office how to get to the nearest one. 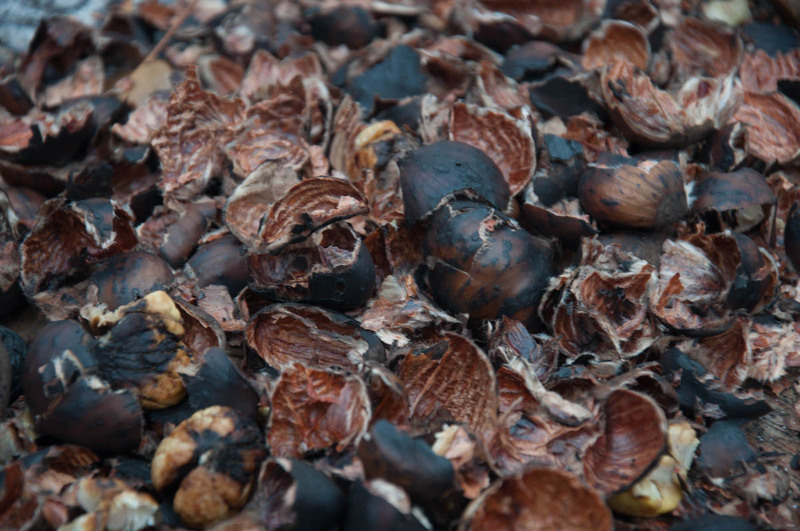 What Is the Story of Roasted Chestnuts and Castagnate in Italy? People have been eating chestnuts for thousands of years. As far back as the Old Stone Age people would collect chestnuts, roast them and eat them. Later on, the Ancient Greeks and Romans actually started to plant and cultivate chestnut trees. For example, the Romans introduced chestnuts to Britain. The chestnuts would be eaten either roasted, boiled, dried or ground into flour which was then used in the making of bread, pasta, polenta and cakes. Chestnuts were a staple of the diet of, especially, the poor people all through the Middle Ages. If a place was unsuitable for the growth of grains (like some areas of the Italian-Swiss Alps), people would grow chestnut trees. Rich in carbs and low in protein and fats, chestnuts were a cheap fuel for people who had to work hard. In addition, chestnuts were very versatile food suitable not just for people for also for their livestock. For example, chestnuts of lesser quality were fed to the pigs which gave their meat a nice sweet taste. Chestnuts were only displaced towards the end of the 18th century when the cultivation of potatoes and corn – originally brought from America – became prevalent. Yet to this day, there are large chestnut forests in Italy and come October and November people get together to indulge in some freshly roasted chestnuts. In the Northern Italian region of the Veneto, where I currently reside, the chestnuts from San Zeno’ are particularly well-known. San Zeno’ di Montagna is a small village on the slopes of Mount Baldo just off the eastern shore of Italy’s largest lake – Lago di Garda. Its adjacent area is famous for its chestnut woods where some of the trees are centuries old. 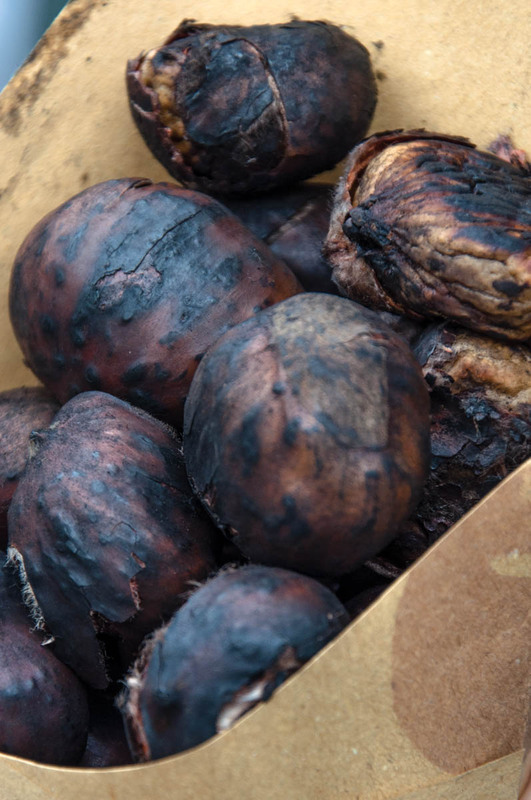 The chestnuts grown in San Zeno’ enjoy a Protected Designation of Origin (PDO) status. They are oval and large in size with sweet tasty pulp. 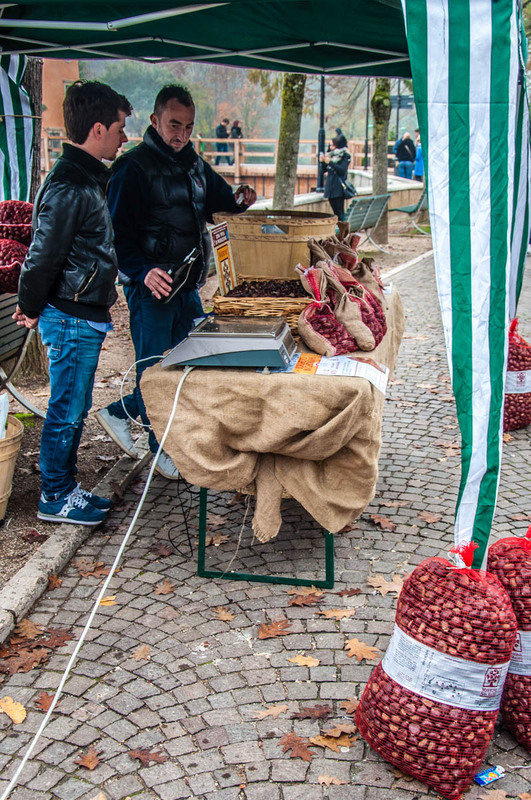 Have a look at the official site to learn more about the chestnuts from San Zeno’, the traditions attached to them and the annual chestnut festival which attracts thousands of people to this lovely corner of Italy. 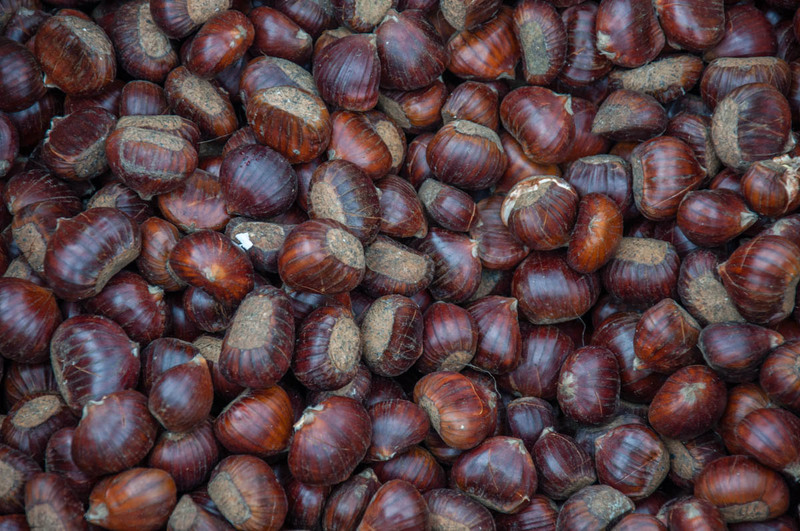 Why Italians Have Two Words for Chestnut? both of which are translated as chestnut in English. Italian sources clearly state that there is a distinct difference between castagne and marroni. We were told by the roasted chestnuts seller in Borghetto sul Mincio that castagne is what you give to livestock and marroni is what people eat. However, a bit of research shows that this is not quite/fully true. Castagne or Marroni? These are the differences by the Italian agricultural magazine Vita in Campagna. 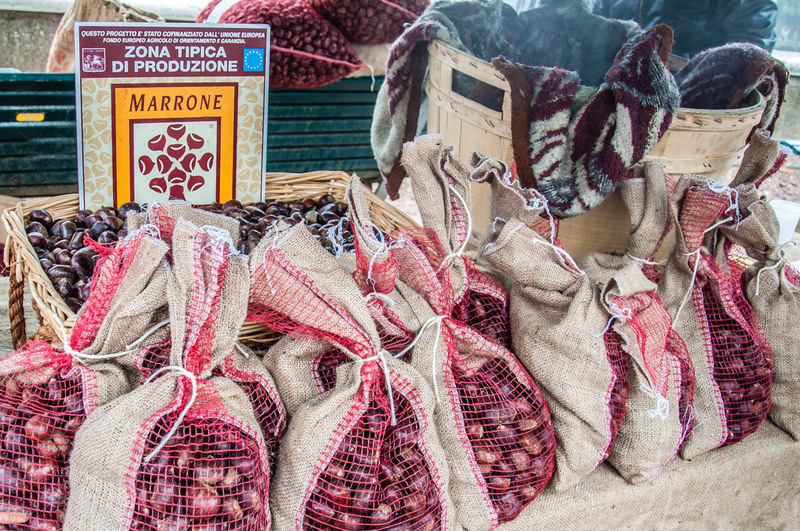 This article explains in detail how castagne and marroni differ from one another. There is also a small photo of a castagna and a marrone side by side for you to see the visual differences. To round it off, there is a list of Italian marroni based on their geographical origin. Castagne and Marroni – what is the difference by the Italian culinary magazine La Cucina Italiana. The differences seem to point that marroni are more refined than castagne in so that marroni have a sugary and crunchy pulp which maintains its consistency after prolonged cooking. Also, they have a soft shell over a thin skin which is easy to remove and doesn’t cut into the pulp itself. The second article also points to the fact that castagne are the fruit of the chestnut trees that have grown in the wild. Marroni are chestnuts from cultivated trees. In any case, I encourage you to read (if need be via Google Translate) the two original articles above. They give some very interesting information on the matter. 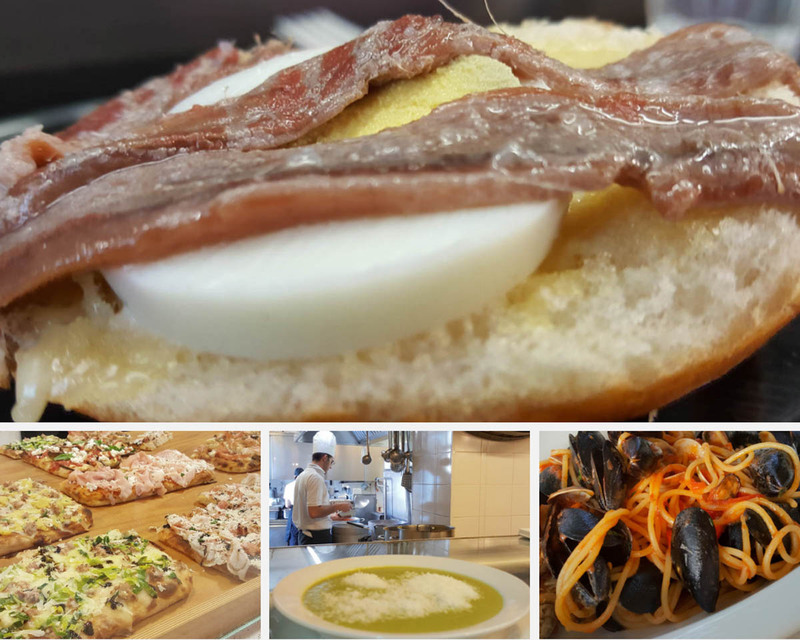 If you happen to be in Italy either in October or November head straight to the nearest castagnata. 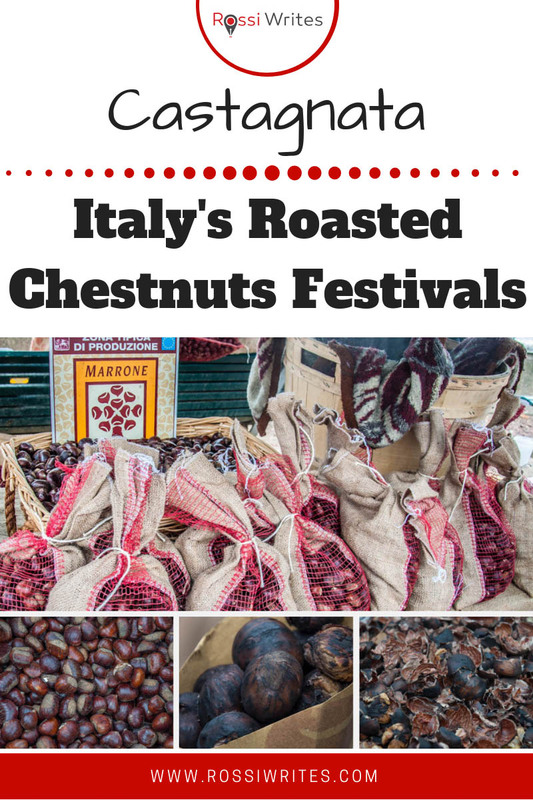 This is an Italian roasted chestnuts festival with deep roots and traditions going back centuries. 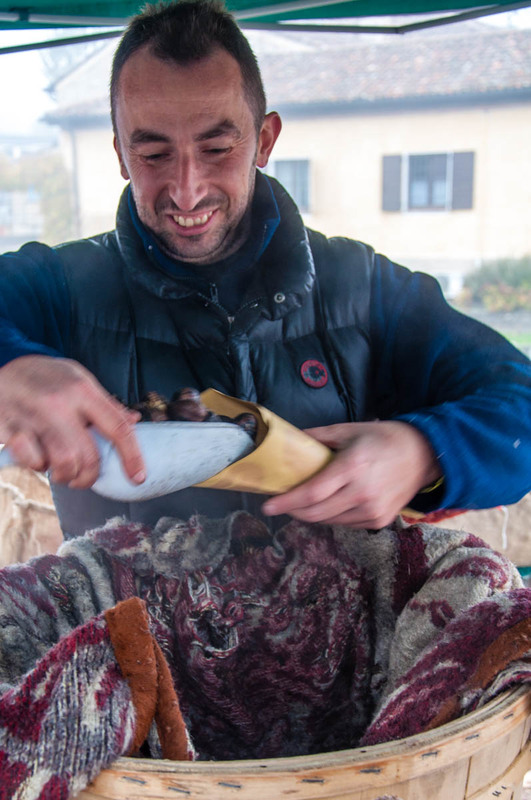 You will not only tick another cultural experience off your Italian bucket list but you will also indulge in some of the best roasted chestnuts ever. Just their smell on a foggy and cold autumn day is enough to fill your soul with pleasure.